Velika Gospa is a national holiday that celebrates the Assumption of the Blessed Virgin Mary. 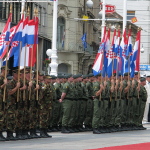 It is celebrated on August 15 annually in Croatia. 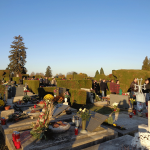 In celebration, believers make a pilgrimage to many of Mary’s shrines. According to Catholic theology, Mary is embedded in heaven with soul and body. On November 1, 1950, Pope Pius XII declared the doctrine of Mary’s ascension to heaven. It is preceded by a long tradition that is old as Christianity itself. The holiday is celebrated in a large number of countries, most notably in Europe and South America. Many processions and festivals are held. Sinj, a town in rural Dalmatia, is the site of one of the most important sanctuaries of the Blessed Virgin Mary where celebrations are held for Velika Gospa. On August 15, a great celebration for the Feast of Assumption is held. A vast multitude of pilgrims come to Sinj to bow in silent prayer and to light a candle before a painting of the Madonna. Many people from across Dalmatia walk barefoot or just on foot to Sinj. 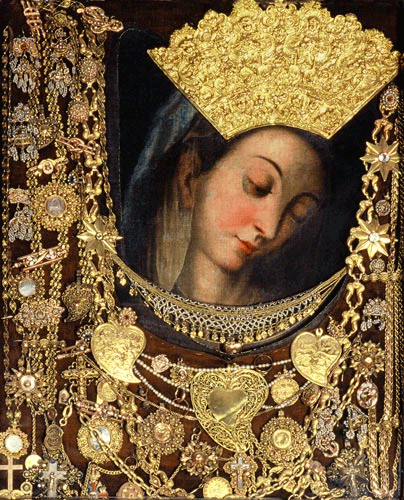 The first mass is celebrated at 4 a.m. At 9.30 a.m., accompanied by the solemn ringing of bells and the sound of fanfare, the Painting of the Miraculous Madonna of Sinj is taken out of the Church to be brought into a procession through the streets of Sinj. It is a great honor to carry the painting on one’s shoulders. 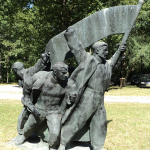 The painting may be carried by the Alkari, the Alka squires, policemen, members of the Croatian Army, firemen, members of the Association of Croatian volunteer combatants, members of the Association of Homeland War veterans and volunteers, members of civil associations, nuns and Franciscans, bandsmen, girls in folk costumes, mayors and benefactors of the Sanctuary of the Madonna of Sinj. Cannon balls (mačkule) are fired from the Old Town fortress, thus indicating the benediction place. The people of Sinj sprinkle flower petals from the windows on the Madonna’s path. Accompanied by the prayers of the rosary and liturgical songs worshiping the Madonna, the painting is brought back to the square in front of the church where the service is celebrated. 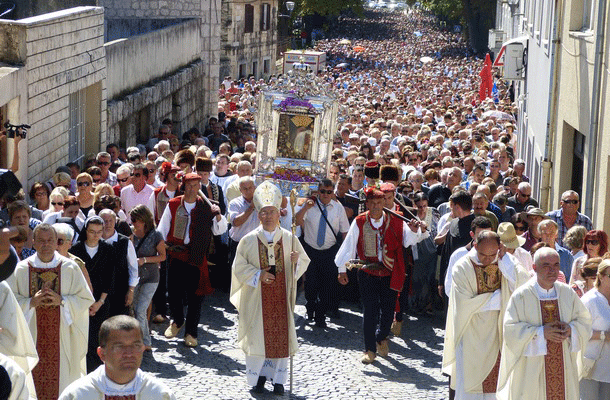 Feast of Assumption is further celebrated as the Day of the Town of Sinj. 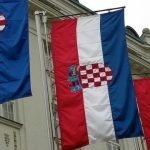 Hello Sarah, my family will be visiting Croatia next month and Sinj is on our itinerary. Being a Catholic and we would like to attend the Sunday Holy Mass at the Sanctuary of the Miraculous Lady of Sinj. Just wonder if you could advise me of their Sunday Mass schedule to plan our trip. Thanks.